Kurt Angle should have an ego. He is an Olympic freestyle wrestling gold medalist, a multi-time World Heavyweight Champion, a George Tragos/Lou Thesz Hall of Famer, and a WWE Hall of Famer as of this weekend. 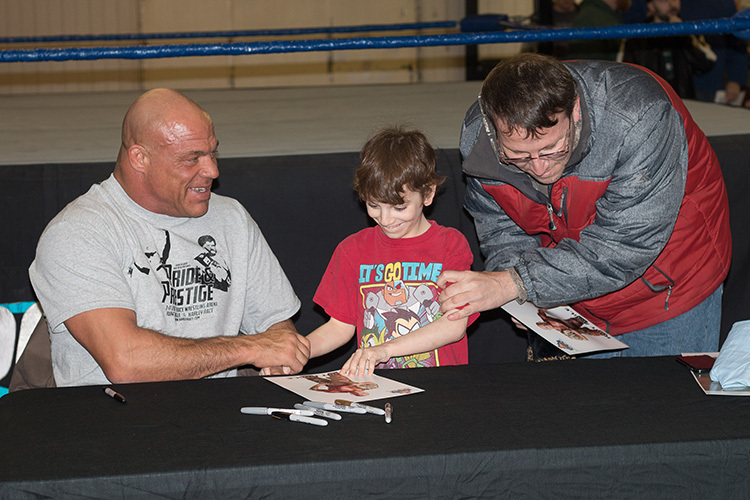 Yet, when he visited World League Wrestling for a meet-and-greet prior to an event in Troy, Missouri, he was so humble and polite you could tell that he cared for his fans. 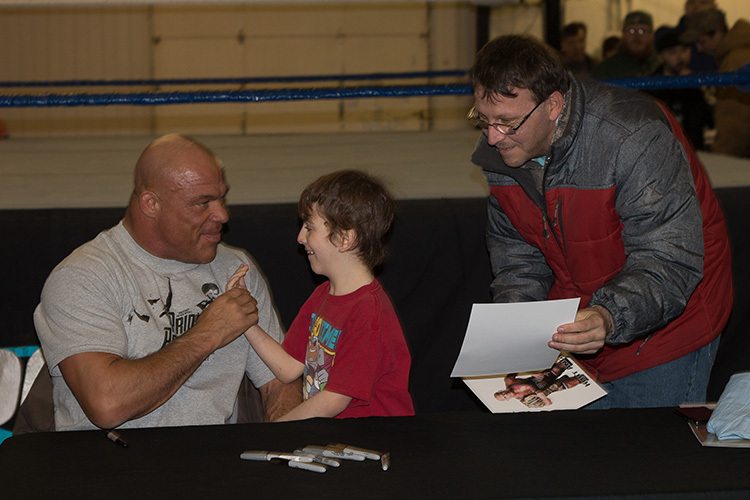 Prior to the event, Missouri Wrestling Revival worked with Harley Race, Leland Race, and WLW to welcome Katie Masson to the Race Arena as a special guest to meet Kurt Angle prior to the event. She is diagnosed with cri du chat, also known as 5p- syndrome. It’s a chromosomal deletion disorder resulting in a wide spectrum of intellectual and developmental abilities. 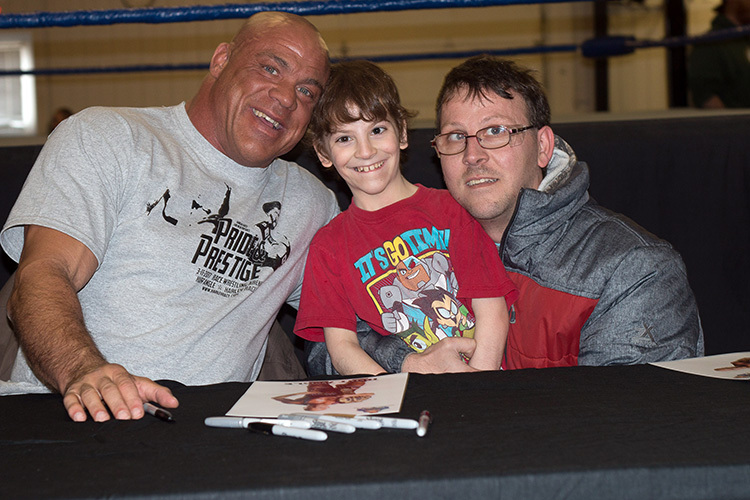 I took photos for the fans with Kurt Angle. When Katie and her father Billy Jack Masson came up to meet Angle, I wished I would have video-recorded the encounter. It was a moment that will forever be remembered in the Masson household. It was a pleasure to meet the Massons that day, and MWR Artist Dartallion Allen Jr. surprised Katie with several exclusive Top Draws of current WWE Superstars for her as a birthday gift. During the matches, the Massons sat in the front row. 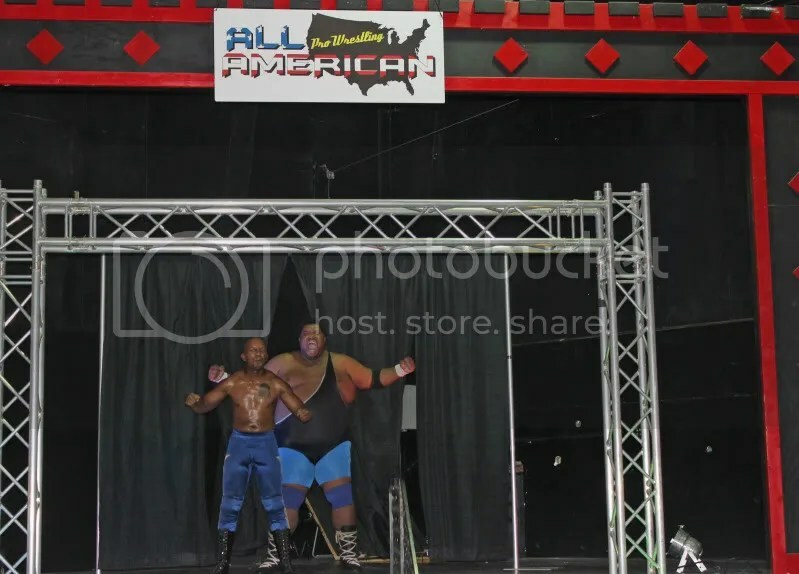 They even got a welcome to the Race Wrestling Arena in front of the crowd by ring announcer Brian Thompson. 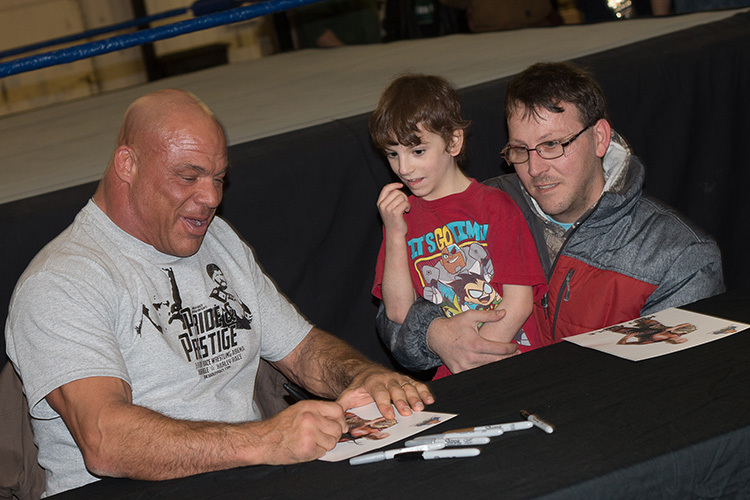 The day and night was highlighted for me by great moments that included watching Angle and Harley Race enjoy some one-on-one time, many great matches, and even one of the biggest roar of the crowd I have heard when Angle (as a special guest referee) leveled Jayden Fenix during the Leland Race–Fenix match. 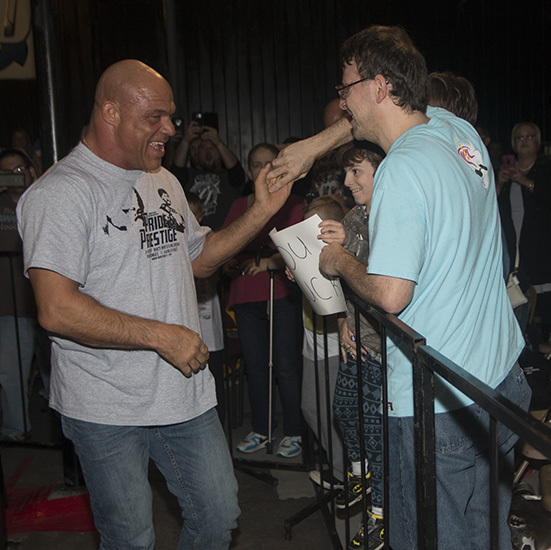 Still, my lasting impression is the sincere moment that Kurt Angle shared with Katie Masson. Sometimes no matter how long you have been doing something, you always find your way back to your initial beginnings. My personal pro wrestling journey started around 1998 or 1999, creating my own wrestling website (anyone remember Angelfire URLs?) 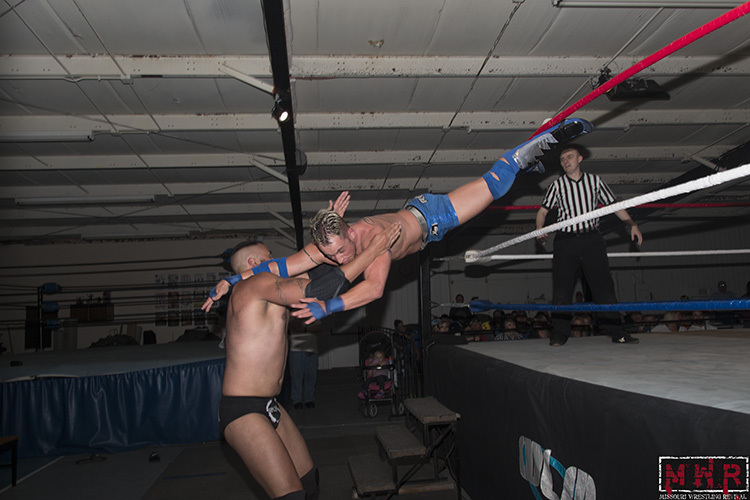 and covering independent wrestling in the southeast Missouri part of the country. Think of it as a poor man’s version of Missouri Wrestling Revival, which has obviously taken things to a totally different level. 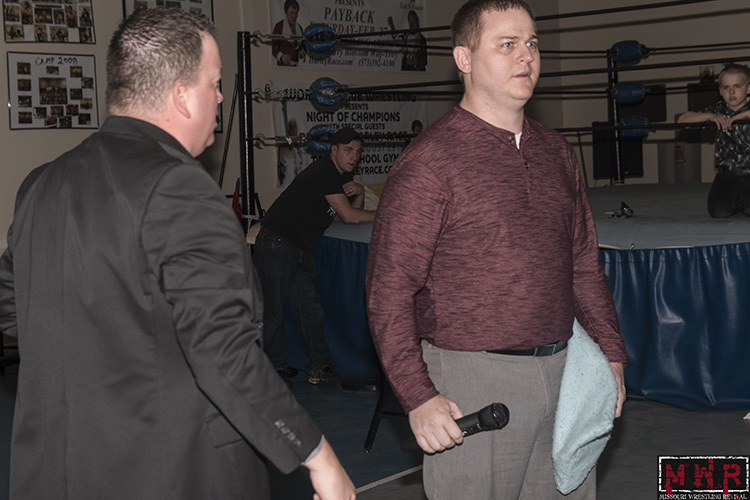 Long story short, I reached out to Brian Kelley about returning to my pro wrestling columnist days and those humble beginnings nearly two decades later. Wow. Just typing two decades later makes me realize I am not getting any younger! 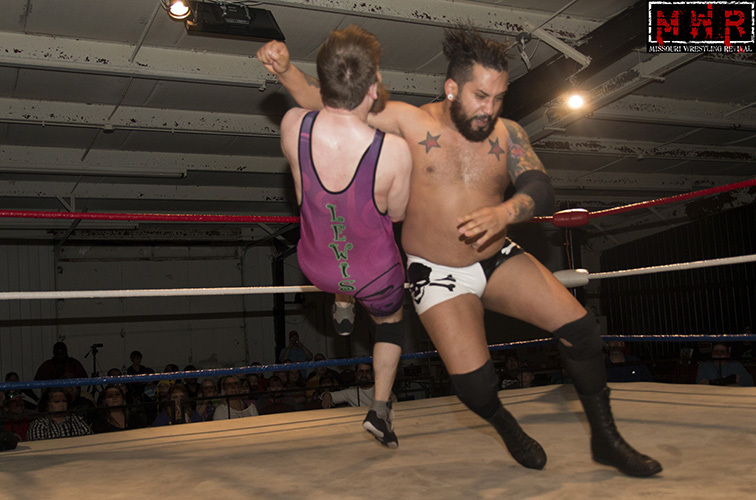 For the debut of this column, I want to broach a subject that is on the minds of most people involved in the wrestling community in the Midwest – the National Wrasslin League (NWL). Regardless of what anyone might think, they are creating a buzz and a buzz is what you want when trying to establish a new venture. I think Michael Elgin penned a great viewpoint on Twitter recently about NWL. I encourage you to seek that out if you haven’t already seen it. Now onto my thoughts. First, I think management of the organization needs to be commended. Promoting pro wrestling is a huge risk at any level you try it. Trust me. 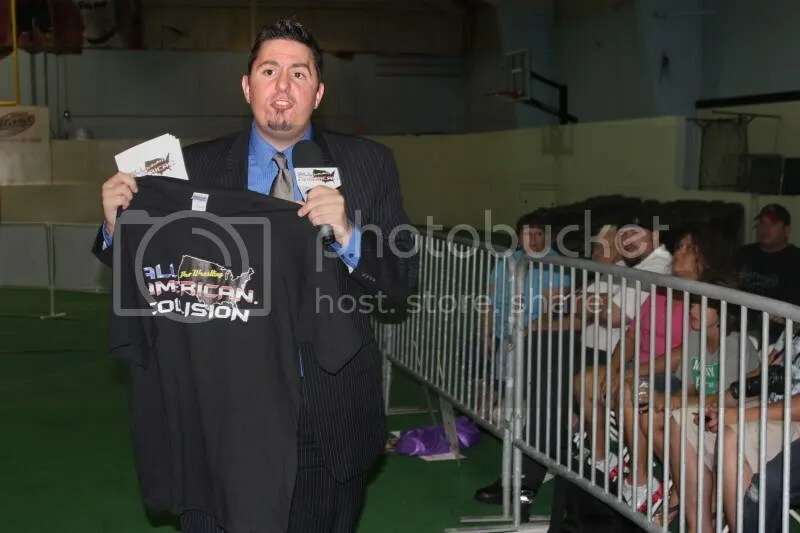 This is coming from experience from being involved in different ventures since I first began my career in 2000 as a ring announcer for Gateway Championship Wrestling in St. Louis. Almost 17 years later, I feel I have learned a lot – as much from failures as from successes. When a person takes his or her own money and puts in on the line, whether you believe in the concept or possibilities, the person at least deserves some respect. Contracts are being offered to talent. They are getting the chance to develop new gimmicks or characters. 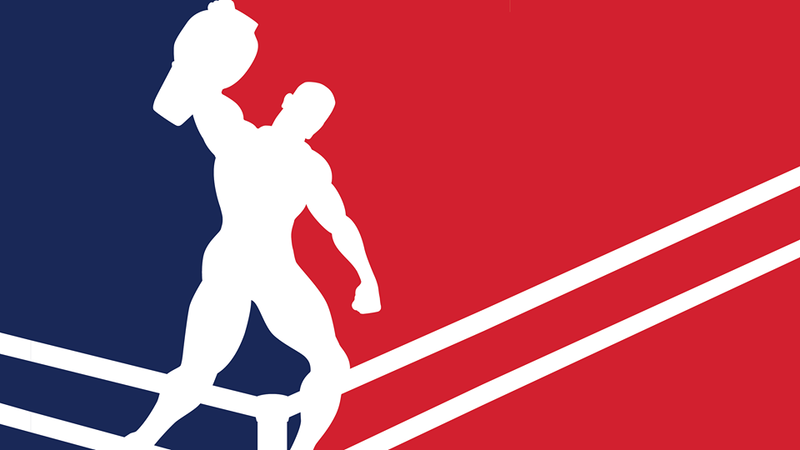 I have no direct idea of what these contracts entail, but I know many of the athletes and competitors who will be a part of the NWL venture on both sides – St. Louis and Kansas City. I hope to see the organization succeed if for no other reason than to support the dreams and goals of these talents. Will the regional concept work? I’ve often told people that if I had significant finances to make a “real run” that a regional concept is the way I would go. I’d hope to build up a company that could get a stronghold in whatever part of the country it existed in. Think regional concept with a national footprint. With all the streaming media and online options today, a company can truly put its product out beyond its touring borders in ways never possible before. And as far as actual TV, I’d try to work a deal with maybe a Fox Sports affiliate. I saw Pro Wrestling Ohio with a show on a regional sports network there called Sports Time Ohio several years back. With my Dish Network package, I even got their show. I always thought that was a very good marketing strategy. I think in trying to make a big splash, the regional footprint is a smart way to go. Time will only tell if this idea, concept and venture works. I hope it does for several reasons. 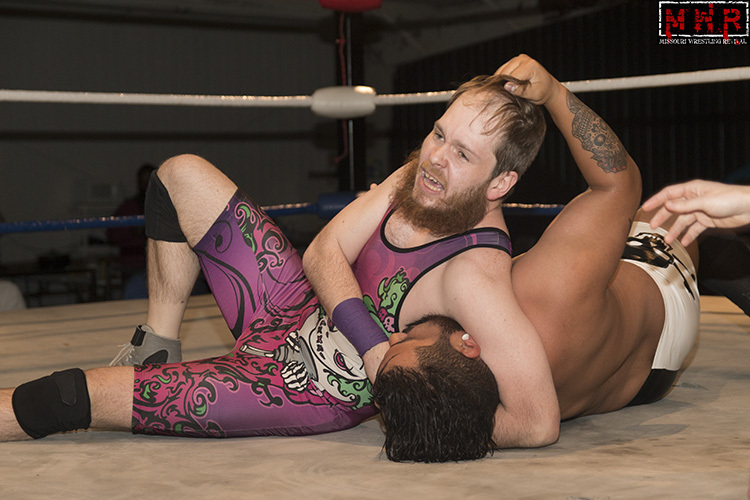 First and foremost is the previously mentioned talents that will be earning a more regular income from wrestling. That is a goal for most of us in the wrestling business in one way or another. Second, the more successful this is there is the strong possibility of a trickledown effect. For the talents who will be able to work other shows, they would become more valuable for themselves in terms of talent fees as well as more marketable to the promoters who use them. A win-win for everyone. Will this be easy? Not at all. But guess what? No business is “easy.” If they were we’d all own our own business. It takes time. It takes investment. It takes patience. As far as management, I think the ones who I understand are involved with NWL bring a mixture of skillsets to the table. Chris Gough obviously has been a part of the biggest wrestling/sports entertainment company in the world and has seen how they operate. He’s also had success with his own independent promotion in the Kansas City Metro. I believe Pierre Abernathy is involved in the St. Louis arm of things. He’s had experience running shows in that metro which only helps the cause. And I’m actually excited to see what Scott Bowden brings to the table. 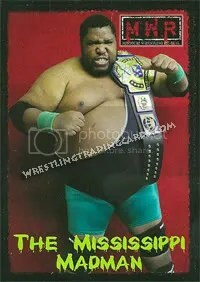 I was a fan of his work during the Memphis days with the United States Wrestling Association (USWA). Being a part of the last surviving territory system can only have helped his knowledge of how to promote and support a wrestling venture. He was on live television for years and saw how that worked. And not live to tape, we can edit later, I mean LIVE as in WMC TV-5 in Memphis with no re-takes. As we enter 2017, I saw good luck to NWL and good luck to all independent promotions around the area. I hope for a most prosperous year for everyone. 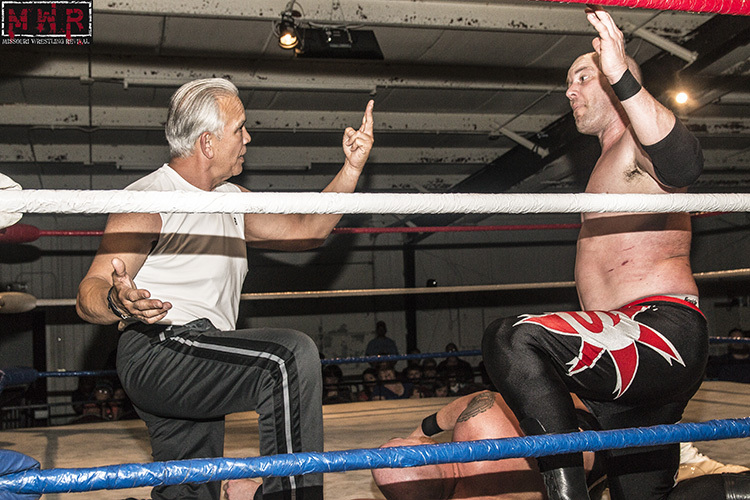 Of course, the special guest at WLW was a factor in my decision: Ricky “The Dragon” Steamboat. I got started as a regular wrestling viewer after his most famous feuds with “Macho Man” Randy Savage and Ric Flair, but he was in the opener of the first pay-per-view that I saw via home video(SummerSlam 1991). I heard about the Savage and Flair feuds after the fact and got to see some of his classic bouts through home videos and WCW’s “All-Nighter” marathons. His career essentially ended in 1994 after being injured in his U.S. Title win over some nobody named Stunning Steve Austin, but he had a brief WWE comeback in a feud with Chris Jericho. 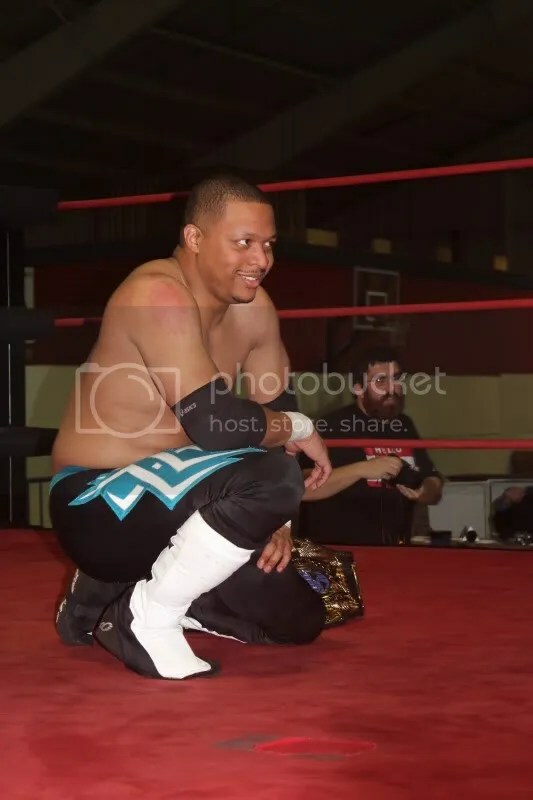 His son Richie briefly wrestled for WWE’s developmental system in Florida Championship Wrestling and then NXT, but injuries cut his wrestling career short. Steamboat was an eternal fan favorite for his entire career, despite a handful of temptations to stray to the Dark Side of The Force. 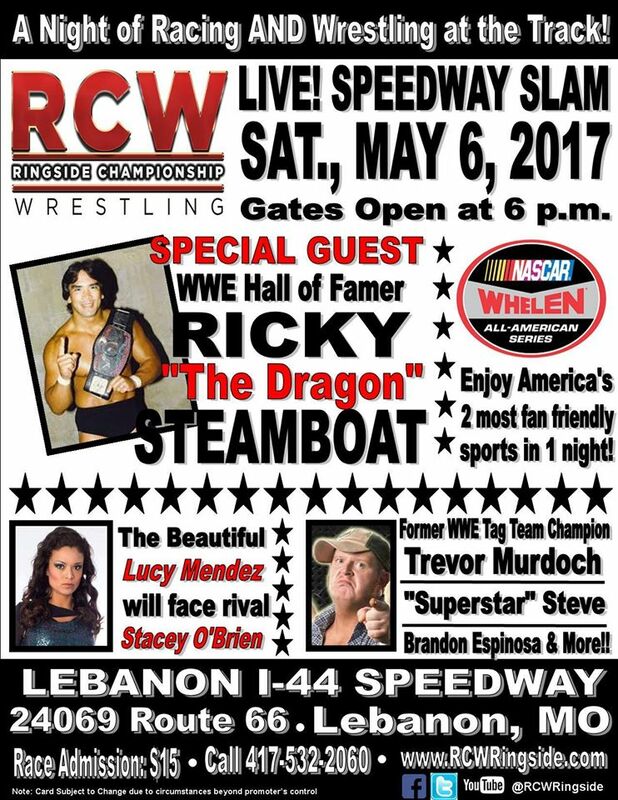 As set up at the April show, Steamboat had already been announced as the special guest but became the special guest referee for the night’s main event bout between Leland Race and Steve Fender. Also, WLW’s first Junior Heavyweight Champion was scheduled to be crowned on this night in a tournament final between Jon Webb and Jayden Fenix. The show had a strong turnout due to Steamboat’s presence…not competing with playoff hockey may have also been a factor. (Go Blues!) 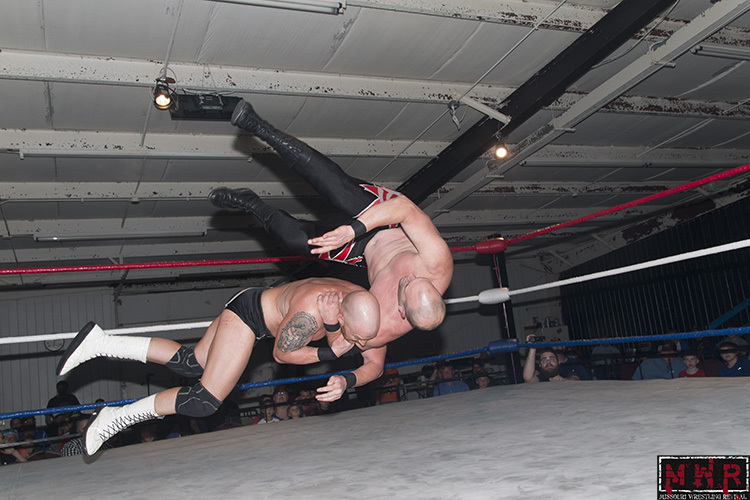 I looked after the Missouri Wrestling Revival merchandise table as Brian Kelley took photos at ringside…woo. Your ring announcer was Brian Thompson; your referee was Richard White. 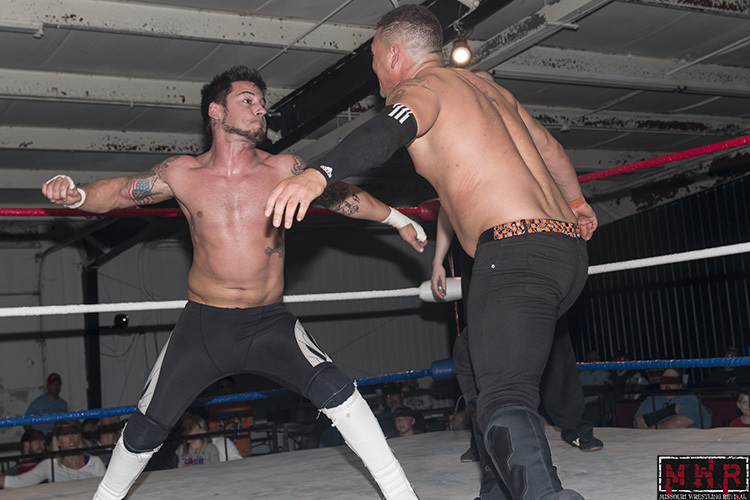 Roy Lewis vs. Cody Jones: This was my first time seeing Jones in action; I had seen him at previous independent shows but not in the ring. My initial thought was speculation on who Lewis would be losing to, then I immediately noted that he could have been facing Air Raid or something. 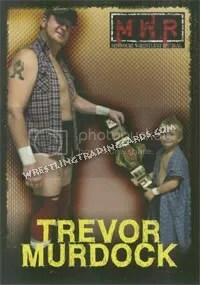 However, this one was honestly a pick-’em with a rookie fan favorite against a relatively unknown rulebreaker. Lewis is one-third of the Troy Athletic Club with “The Freestyle Phenom” Jay Howard and “The Natural” J.A. Fair, but he usually flies solo when competing in this area. It was a fine underdog effort for Lewis who survived a lot of heavy artillery from Jones; Jones went to the top rope but missed a frog splash. 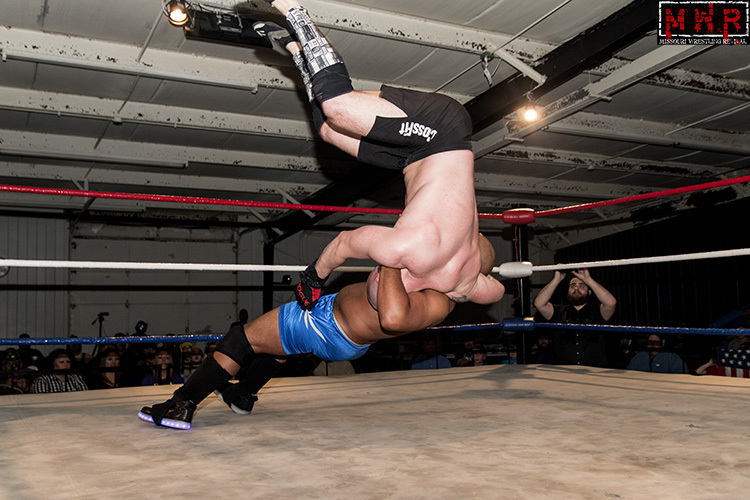 Lewis capitalized with a La Majistral cradle for the flash pin in 8:12…ROY WINS~! 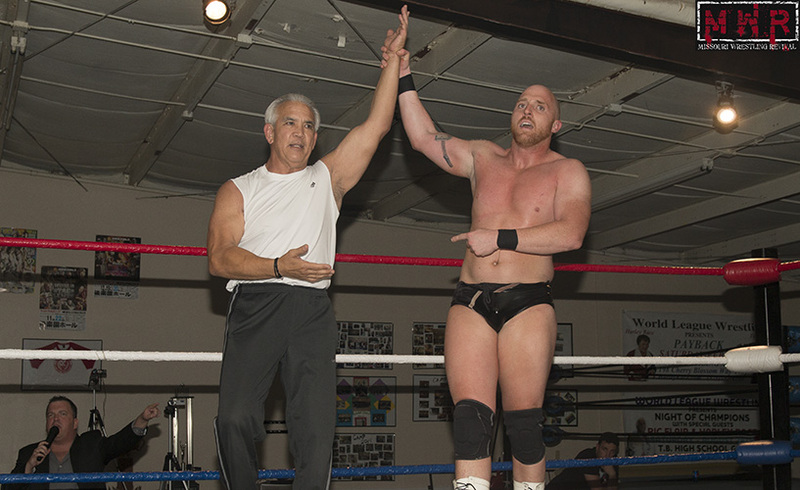 He celebrated his first WLW win in grand fashion with Brian Thompson acknowledging it. 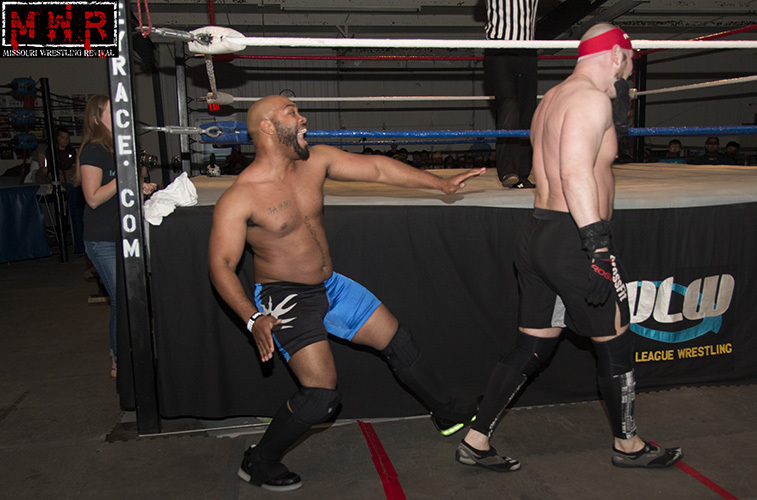 Justin D’Air vs. “The King Of Crossfit” Mark Sterling: D’Air has recently been sporting light-up wrestling boots, a la Naomi Night’s footwear in WWE; Sterling was emphatically unamused, so D’Air decided to poke fun at Sterling’s toe shoes. Hey, a feud over footwear would be far from the weirdest reason for an issue between professional wrestlers. 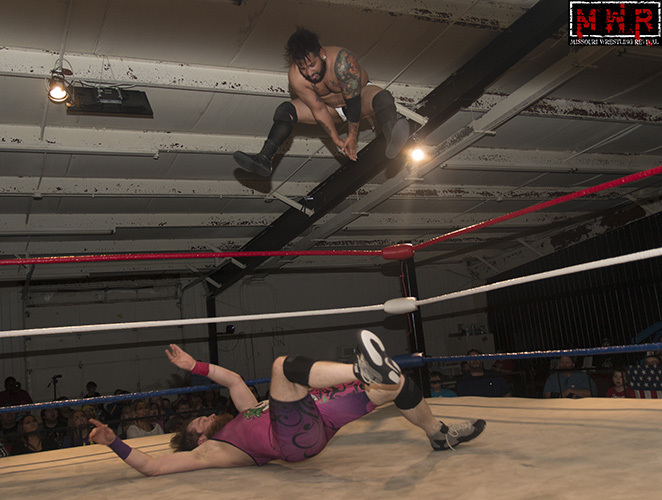 At any rate, these guys had a solid competitive matchup; Sterling avoided a 450 Splash and D’Air rolled through for a relatively safe landing, but Sterling got the rollup pin with a handful of tights in 11:50(HEEL~!). Stacey O’Brien & Lucy Mendez vs. Women’s Champion “Miss Natural” Heather Patera & Paloma Starr: Hey, a women’s division! While the “Divas’ Revolution” has seemingly cooled off to some degree, it’s been good to see women’s wrestling get a higher profile on the national stage. Despite their recent issues, Stacey and Lucy worked well together as a tag team. 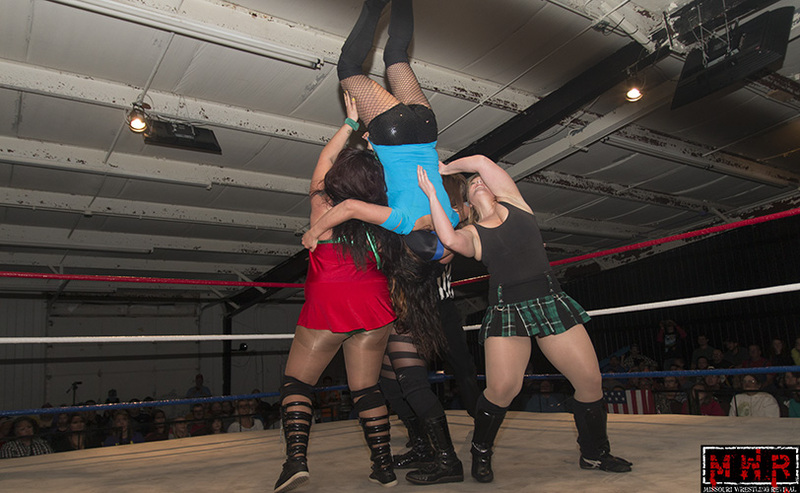 On the other side, the newer duo of Miss Natural and Paloma Starr had a few glitches in their teamwork, leading to a few shifts in momentum. 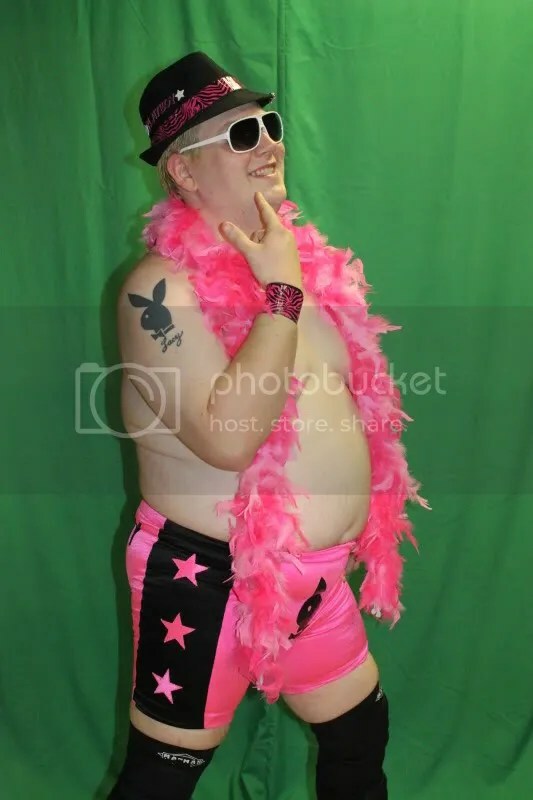 Stacey had defeated Miss Monica at the April show to re-establish herself as the top contender to Miss Natural’s title. Stacey went old-school with her ring attire, going back to the plaid skirt ensemble. Things broke down near the finish and I felt like more than one person lost track of who was legal, particularly the referee. I could have sworn that Lucy and Natural were legal, but Stacey hit the backcracker on Paloma and got the three-count in 12:16…all righty then. It was a fine match, at any rate. 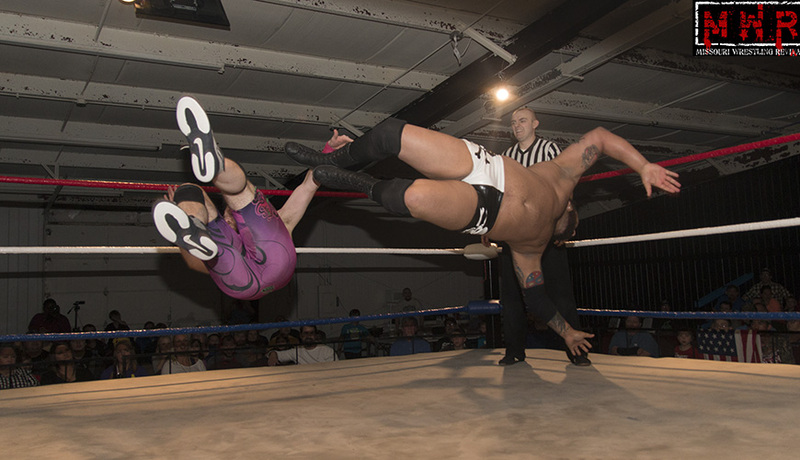 “Kickin'” Kyle Roberts vs. Karim Brigante(w/ Miss Monica Passeri): This stemmed from Karim physically abusing his valet at the April show, leading to Kyle making the save. In a pre-recorded video, Kyle told Karim that men don’t put their hands on women in America. 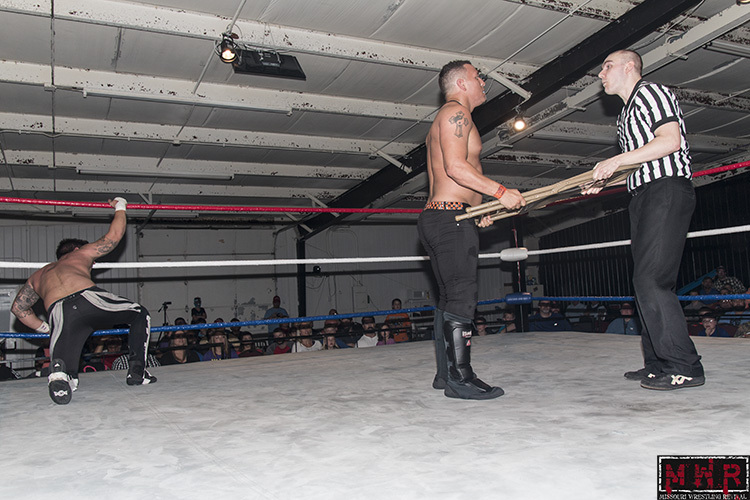 The video promo prompted a sneak attack by Brigante in the locker room area, as well as a counter-promo. 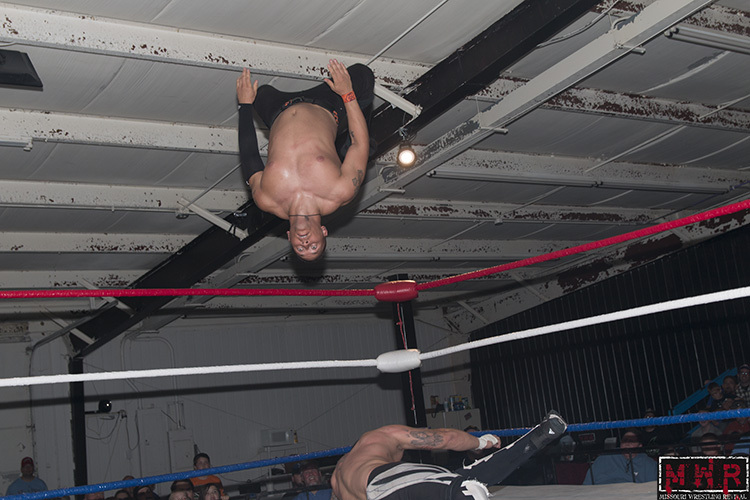 Brigante has struggled to pick up wins in the Midwest, though I think he won a battle royal at a WLW show elsewhere in Missouri. 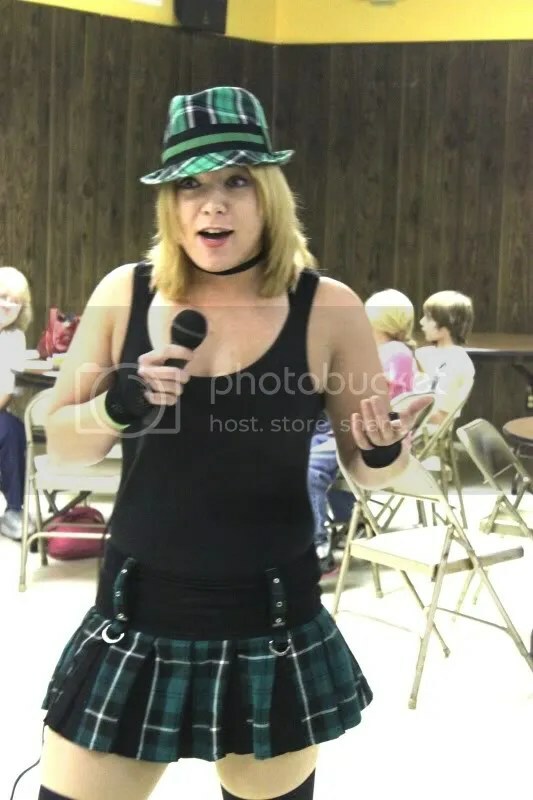 At any rate, Monica interfered on a few occasions and finally slipped a chain into the ring for her man to use; this brought out Stacey O’Brien for a brief Catfiiiiight(tm Joey Styles). The referee turned his attention to the action on the floor and missed Karim KOing Roberts with the chain, getting the tainted pinfall in 11:43. BUT WAIT~! The referee discovered the international object after the fact and ordered a restart to the match…Roberts immediately capitalized with an enzuigiri and rollup for the real victory in 0:12 of the restart (11:55 total). …not so fast. Murphy voiced his disapproval of both men’s actions and said that the lineage of the new championship shouldn’t start that way. As a result, he declared that a no-DQ rematch would take place at the show on August 27th and the winner of THAT match would be the first Jr. Heavyweight Champion. “The Legacy” Leland Race vs. “Superstar” Steve Fender, special guest referee Ricky “The Dragon” Steamboat: In April, Heavyweight Champion Trevor Murdoch & Fender defeated Race and The Math Magician(one of these names is not like the others…) when Fender pinned Race; this match was set up to determine a top contender to Murdoch’s title. 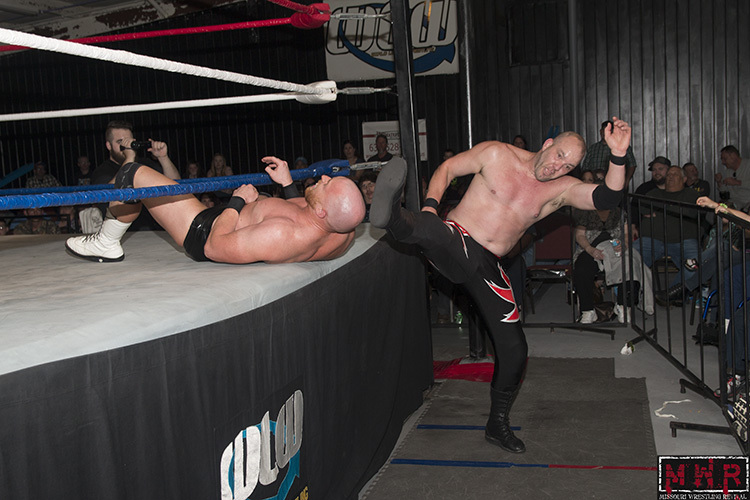 (Of note, neither Murdoch nor Tag Team Champions Michael Magnuson & Dave DeLorean were in the house on this night.) The match was good but the crowd response was a bit down; they were probably waiting until Steamboat had his “moment” before they got invested. Several spots were obvious odes to Steamboat: Backflip out of an armwringer, armdrags, inside cradle counter to a bodyslam, etc. 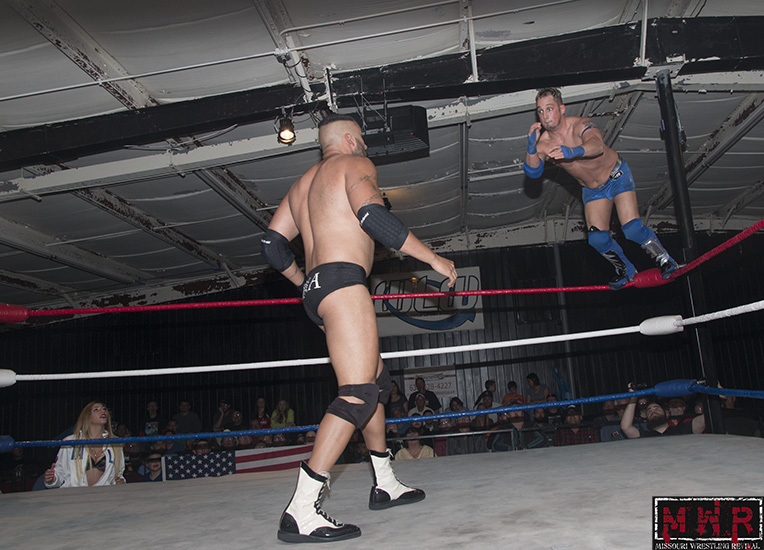 All it was missing was a cross-bodyblock off the top rope. Steamboat was bumped down and Fender hit the brainbuster(which was how he won the tag match in April), but Steamboat wasn’t available to make the count. When he did recover to count, Race kicked out at two-and-a-half…leading to the anticipated confrontation between Steamboat and Fender. Fender repeatedly shoved Steamboat until The Dragon finally retaliated with a shove of his own to assert his authority…at that point, the match continued and Fender’s loss of focus may have contributed to his downfall. The two traded near-falls until Race finally finished with the Go 2 Sleep in 19:36…woo-hoo. I imagine Murdoch vs. Race will be the main event of the show in August…we’ll see how the rest of the card shapes up. Harley Race Presents World League Wrestling-TV! Episode 9! 8-Time NWA World’s Heavyweight Champion and WLW Owner – Harley Race – presents to you Episode 9 of WLW-TV! This weeks episode features a wrestler that you haven’t seen on this YouTube Series before – that being Karim Brigante – along-side of his manager – Miss Monica. 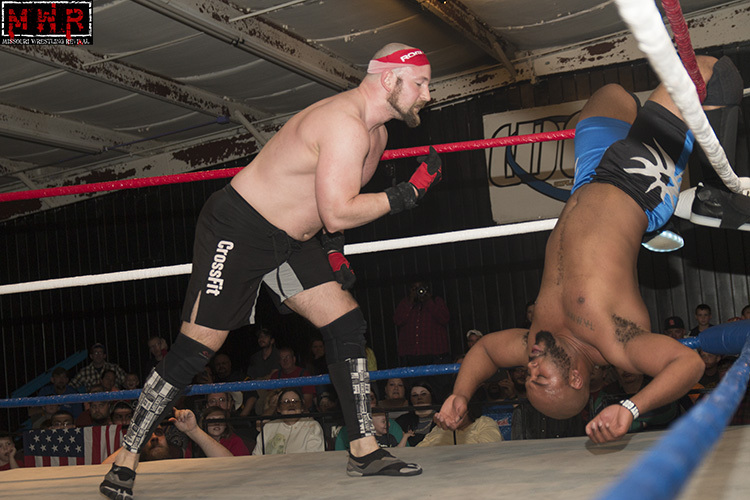 He goes head-to-head with fan favorite Jon Webb! In the main event of this week’s episode, the Black Hand Warriors challenges for the WLW Tag-Team Championships in a feud that has been brewing for months! No, this isn’t an article on how I, “The Golden Boy” Greg Anthony, make the greatest PB&J sandwiches. Instead an analogy pertaining to pro wrestling. Now bear with me on this one. I think it would be safe to say that Peanut Butter and Jelly is probably one the greatest combinations in the history of man. Perfectly complimenting each other so much that now it’s impossible to imagine one without the other. So let’s say that Pro Wrestling is Peanut Butter or Pro Wresting=Peanut Butter for you math geeks. What would be Jelly in this equation? Well the solution is simple, Music! Can you imagine the last thirty years of pro wrestling without music? No glass breaking for a “Stone Cold” Steve Austin entrance, no unmistakable guitar riffs, no spine rattling drums. Great moments that no longer exist because there wasn’t a soundtrack for that moment. Music is truly a universal language and has made its impact on every form of entertainment and pro wrestling is no different. Now we all know that Michael Hayes is credited with being the first to use rock music in his entrances. From Lynyrd Skynyrd’s “Freebird” to one of my all time favorites “Badstreet USA” ,where Mr.Hayes sang lead vocals, his impact on the business in this aspect is legendary. Now look how far we’ve come with music in pro wrestling. WWE alone has released 22 albums that have done very well commercially. Now P.S. Hayes wasn’t the first to come out to music in general and I don’t know if anyone really knows who the first actually was. I remember my grandmother telling me that Gorgeous George use to come out to “Pomp and Circumstance” or the graduation theme as you may know it. Of course it will always be Macho Man’s music to me. At the request of Vince McMahon Sr, Sgt. Slaughter used The Marine Corps’ Hymn in the late 80s. Music has had as much of impact on wrestling as anything else. In 2009, music and wrestling are a given. I’ve had to work shows were the sound equipment breaks or the guy who owns the speakers quit the company. Now to enter without music, it seems like something is missing not just to me but the fans as well. It’s like….. like eating a Peanut Butter and Jelly sandwich without the jelly, I promise and when “The Golden Boy” Greg Anthony makes a promise it’s as good as gold. —-Greg Anthony is a regular on the local area circuit. He won RRO Booker of the Year 2008 and is listed in the top 5 of the RRO Top 10 2008. 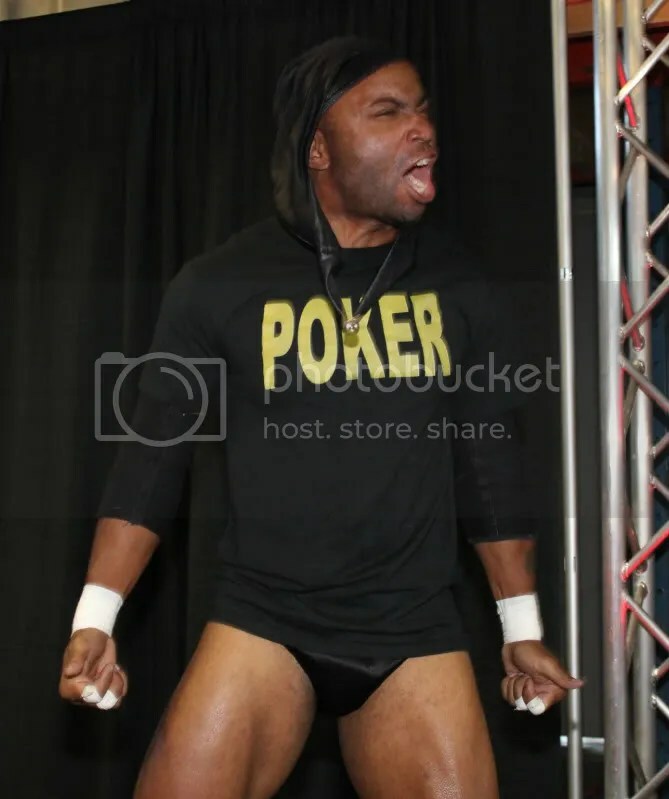 Greg is currently working as booker of NEW and can be seen tagging with legend Bobby Eaton and Brian Thompson as “Midnight Gold”. Look for more of The Golden Circle with Greg Anthony at MWR in the future.